Wednesday 7th March 2012, 6:30 pm. medical imaging - and the difficulties along the way; dealing with legacy code, IP and the change from an academic environment to that of a commercial software house. 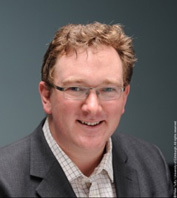 Ben Panter is the Chief Executive of Blackford Analysis Ltd., a University of Edinburgh spinout that develops cutting edge algorithmic solutions to problems requiring real-time analysis of datasets. A key focus for the company is the worldwide medical sector but it also undertakes software design and consultancy work for the oil and gas, and defence industries. Blackford Analysis’ competitive edge is the result of it commercialising its extensive expertise in astrophysics. Ben was responsible for the development of the MOPED algorithm under Alan Heavens during his astro-physics PhD and then for five years as a research fellow at the Max Planck Institute for Astrophysics and the Royal Observatory, Edinburgh. The team saw an opportunity to transfer the technology into the medical imaging sector, and Ben led the development of the project and negotiated the company’s seed investment round. He led the team to win the RCUK Business Plan Competition in 2008, the 2009 THALES Scottish Technology Prize, and the 2010 Nexxus Awards for both Collaboration and Innovation.